The Coal Creek area is perfect for families who desire space in the country without being too remote. Coal Creek is about 8 miles northwest of Longview city limits and just a few miles north of the Ocean Beach Hwy/Hwy-4 which leads directly to Kelso and I-5. Homes for sale in Coal Creek were built in a wide range of past decades and vary in design, but include mostly mobile and single family styles with large acreage. Named for nearby Coal Creek, this is a peaceful rural area just outside Cowlitz County's largest city. 4 Beds | 1.75 Baths | 1632 sq. Ft.
4 Beds | 2.5 Baths | 2326 sq. Ft.
3 Beds | 2 Baths | 2302 sq. Ft.
3 Beds | 2.75 Baths | 3438 sq. Ft.
4 Beds | 3.5 Baths | 2992 sq. Ft.
3 Beds | 1 Baths | 1716 sq. Ft.
3 Beds | 1.75 Baths | 1616 sq. Ft.
Blue Summit Realty has the most accurate and up to date Coal Creek real estate listings on the web. Currently there are 9 homes for sale, and 7 vacant land properties in Coal Creek. Of the 16 total Coal Creek residential listings for sale 0 are bank owned, 0 are short sales, 0 are new construction, and 0 are townhomes. The price ranges from $135,000 to $0 with a median list price of $362,133 and median sold price of $294,210. Make sure to refine your Coal Creek real estate search by property type, price, square footage, bedrooms, bathrooms and more with the search tool above or view the Coal Creek listings on our interactive map. 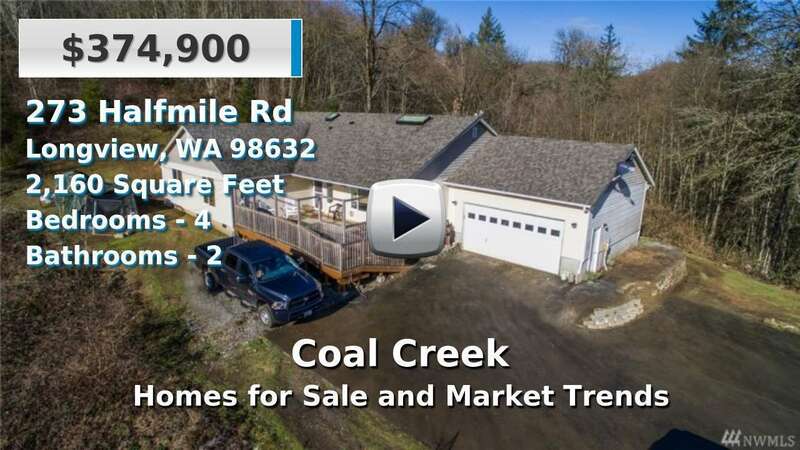 Our Coal Creek real estate listings were updated 29 minutes ago.